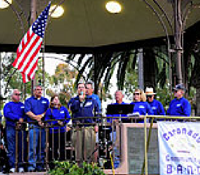 Our traditional opening act and the pride of our town, the Coronado Community Band, under the direction of Phil Imming, brings big brass, powerful percussion, and loads of spirit to the park in musical selections ranging from patriotic to swing. The Hollywood Stones are a super hot live band living all The Rolling Stones hits and cult favorites! From traditional and modern jazz to latin music, contemporary hits, funk and more, the SeaBreeze Jazz Combo is ideal for any setting ranging from public performances to light dinner music. Continually adding new and old easy listening favorites to its repertoire, they will please just about anyone! Southern California’s ultra-high-energy ’80s dance band. With dual male and female lead vocals, Betamaxx thrills audiences with an authentic ’80s sound experience. Enjoy the entire range of ’80s music from Michael Jackson and Bon Jovi to Depeche Mode and Whitney Houston. The spirit of U2 has captured the hearts of millions, including those of five gentlemen collectively known as Zoo2. Since 2002, this Southern California based band has been perfecting one of the most passionate recreations of a live U2 concert making their mark in the tribute band community. This supreme multi-cultural mix of musicians and singers entertain throughout the world, and are guaranteed to please audiences of all tastes with their extensive and diverse collection of material. The Mighty Untouchables offer everything from Motown to classic rock, along with Latin, country, current pop hits, and much more. Their repertoire includes songs from The Temptations, Carrie Underwood, Journey, Christina Aguilera, Stevie Wonder, Guns N’ Roses, Celia Cruz and Tito Puente, just to name a few! A wild tornado of color, sounds, lights and action all wrapped up in some zoot suits! Iliana Rose is nothing short of a fantastic musician. As an accomplished piano player, percussionist, clarinetist and vocalist, she performs with her band and is a complete entertainer. Iliana captivates an audience in English, Spanish and even a little Portuguese and has a unique ability to phrase that is given only to natural born jazz singers. She is spontaneously funny and able to make intelligent hilarious conversations with audience members and it is impossible to resist her charm. You won’t soon forget this curvaceous Cuban babe! Arguably the hottest & most popular concept band working the circuit. This 6 piece band authentically reproduce The Eagles sound. With 3 good lead vocalists you can shut your eyes & believe you are listening to the real thing. As seasoned musicians, Desperado also pay attention to detail to produce the exact guitar sounds you would expect when you listen to an Eagles song. The Eagles Show – Desperado generates capacity crowds wherever it performs. The United States Marine Band is the premier band of the United States Marine Corps. 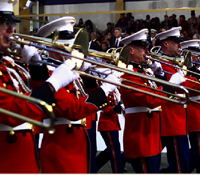 For over 90 years, the Marine Band from San Diego has thrilled countless thousands throughout the country with its inspiring renditions of patriotic music, classical literature, Big Band and Top 40 favorites, and, of course, the marches of John Philip Sousa. 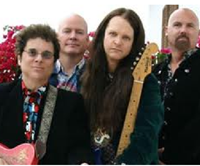 San Diego-based Rockola, winner of eight San Diego Music awards, is a premiere classic rock music experience that performs energetic renditions of favorite songs that is spirited proof that old rock still rolls with popular classic rock from the 1960s and 70’s. If you want to enjoy a truly dynamic performance of rhythm and blues, swing era jazz, and even the occasional torch ballad played with virtuoso skill and most importantly, real fervor, then nothing will beat Sue Palmer and Her Motel Swing Orchestra. 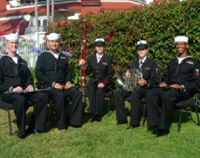 Navy Band Southwest is one of the Navy’s finest and oldest continuing musical organizations. Now with over 80 years of support to the San Diego community, the band serves as the musical ambassador for the Commander, Navy Region Southwest. The Woodwind Quintet ensemble blends the individual sounds of the flute, oboe, clarinet, bassoon and horn to create a highly eclectic sonic palette. They bring this unique sound to works from various genres including music from the Classical and Romantic eras, the contemporary music of Broadway and Hollywood, and the works of many modern composers. Give in to the Fever and make your evening one to remember. Enjoy a cool mix of BLUES, ROCK & ROLL and R&B for an unforgettable fun-filled experience. The boys in the band are all keeping their “day jobs” if you will, but finding a creative outlet in the evenings to get their groove on. 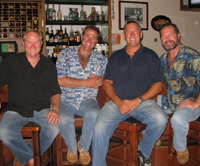 From left to right they are: Phil Hammett, Dan Runyon, Jeff Earl and Steve Patrick.